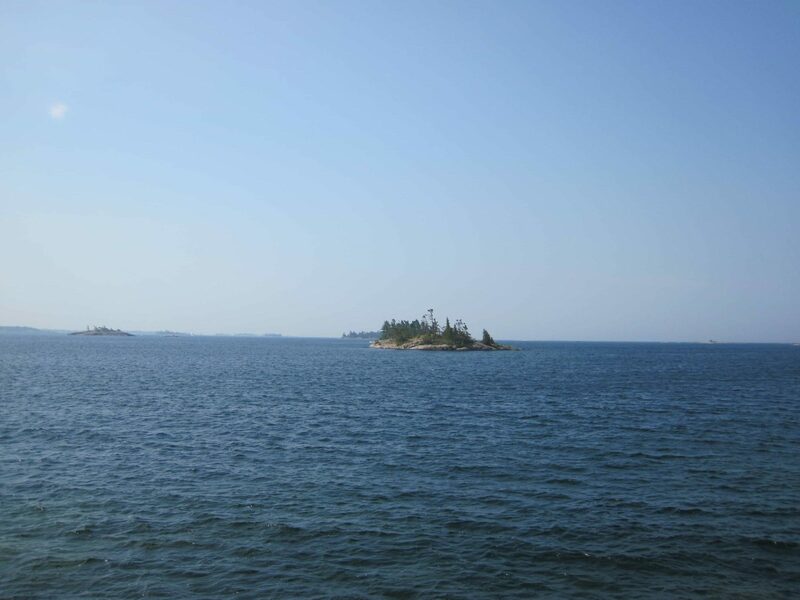 What: The project will investigate the spatiotemporal interplay of climate change, water-level fluctuations, shoreline configuration, and forest dynamics affecting isolated forest communities of a Great Lakes archipelago. Research projects will assess climate reconstructions using tree-rings, the influence of water-level fluctuations on soil and bedrock heterogeneity, and dendroecological species composition and stand structure dynamics. Project Overview & Goals: Little is known regarding the role of feedbacks between climate patterns, coastline geomorphology, and shoreline vegetation on species richness patterns on islands. This project will combine dendrochronological analyses, spatial analyses, soil analyses, and ecological analyses to examine the interplay of regional climate, water levels, soils, and forest dynamics on plant species richness and composition patterns. The project has three main objectives: (1) tree-ring reconstructions of recent climate history in the study area; (2) soil characterization comparisons between recently emerged and established substrates; and (3) spatiotemporal forest dynamics. Each of the three project objectives will be analyzed in relation to vegetation surveys of plant species richness and composition to shed light on the applicability of the prevailing model of island biogeography in areas with fluctuating water levels. Global and regional environmental change has resulted in water-level changes in the world’s oceans and large lakes. With Georgian Bay water levels encroaching upon historic lows, and projected to exceed that record in the coming decades, island areas will increase and shorelines will change. Shorelines in The Massasauga are varied (e.g. steep cliff, sandy beach, cobble shore) and therefore affect the colonization and persistence ability of plants differently. Examination of the dynamic terrestrial-aquatic interface in the Great Lakes is pertinent to many of the conservation and policy issues in the region today. Geologic Background: The Great Lakes contain the world’s largest collection of freshwater islands (Vigmostad 1999). The majority of these islands form dense archipelagos in the Canadian waters of Lake Huron’s Georgian Bay (Ontario). 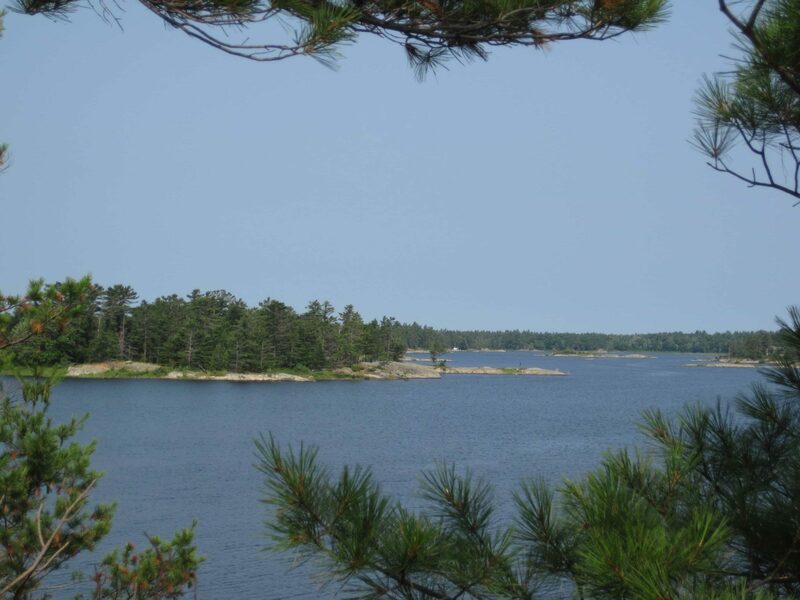 The islands within the Ontario Ministry of Natural Resources’ The Massasauga Provincial Park are located within the UNESCO Georgian Bay Littoral World Biosphere Reserve. The Georgian Bay comprises the northwest portion of the Laurentian Great Lakes, separated from Lake Huron by the Bruce Peninsula and Manitoulin Island. The park consists of over 200 islands which approximate 2,000 hectares (ha) of landmass. The Canadian Shield bedrock of The Massasauga consists of the Parry Sound Greenstone Belt (metavolcanic, metasedimentary, and igneous) and the Ontario Gneiss Belt, both of Precambrian origin (Cordiner 1977; Sly & Munawar 1988). As part of the Grenville Peneplain, the general profiles of the islands are relatively flat, ranging from a few meters below lake level in depression basins to circa 50 m above lake level. Water depths between the islands vary considerably, ranging from less than a meter to depths in excess of 30 m.
Potential Student Projects: Selection of projects will depend on student background and available facilities at the home institutions. During the field portion of the project, participants will work together in teams to develop and execute sampling strategies and collect data on the islands. Data collection includes plant species richness along transects and tree species abundance, tree diameter (dbh), tree coring, and soil sampling within quadrats. Additional data may be collected depending on student interests for their individual projects. Climate reconstructions. Dendroclimatology of climate history is important to understanding possible future scenarios that insular forest stands may withstand in response to a changing regional climate. Climatic and environmental factors influence the growth of tree rings from inter-annual to millennial time-scales. Tree rings allow for the accurate dating of past climatic and environmental conditions. Specific comparisons will be made to climate records in relation to high and low lake-level stands. The student will analyze tree ring widths to establish a chronology. The student will then compare the ring trends and chronology to water-level and climate patterns for the region. The expectation is that tree-ring analyses will yield information about regional climate variability that can then be correlated to the timing of high and low water-level stages. Soil assessment. Determining the spatial heterogeneity of soil characteristics (e.g. pH, organic matter, nutrients) in relation to the spatial heterogeneity of newly emerged shoreline substrates is important in predicting habitat diversity and, thus, species richness patterns on the islands in response to fluctuating water levels. The student will analyze soils data in relation to other variables (e.g. soil depth, shoreline emergence, species richness, etc.) in ArcGIS and a statistical package of their choosing. The expectation of the second project objective is that soil pH and other soil properties differ significantly between recently emerged and established substrates, which could play an important role in interisland patterns of plant species composition and richness. Islands with more recently emerged land area may have a greater diversity of habitats regardless of island size, thus contributing to greater species richness on those islands. Stand dynamics. Dendroecological analysis of disturbance history and cohort establishment is important to understanding age-area-habitat dynamics. Most island biogeography studies focus on spatial patterns of floristic species richness within a snapshot of time. Changes in tree species composition and dominance on an island can bring about changes in physical properties (e.g. light in the understory) or biotic conditions (e.g. the presence of seed-dispersing animal and bird species) and hence cause a change in overall plant species richness. Furthermore, an overstory transition can alter the suitability of an island to support particular species over time due to modifications in soil chemistry, substrate stabilization, competition, and resource availability. This project will use tree-ring data to assess stand structure in order to examine the influence of overstory composition and regeneration on understory plant species richness. The student will analyze establish size-age relationships, create age-class structures, calculate tree importance values, and characterize species population structures for the sampled islands. The student will analyze the data in relation to other variables (e.g. results of the soil analyses, species richness, etc.) in ArcGIS and a statistical package of their choosing to examine general profiles of regeneration trends and future changes in overstory and understory plant species richness. The expectation of the third project objective is that tree-ring age structures will yield information about overstory dominance and regeneration trends that can be correlated to climate and/or disturbance regimes. Most of the travel, housing and field costs will be covered by the project. Student stipends can be used to upgrade suggested travel modes to/from the field site. Students should budget for any extra food or supplies they might want. 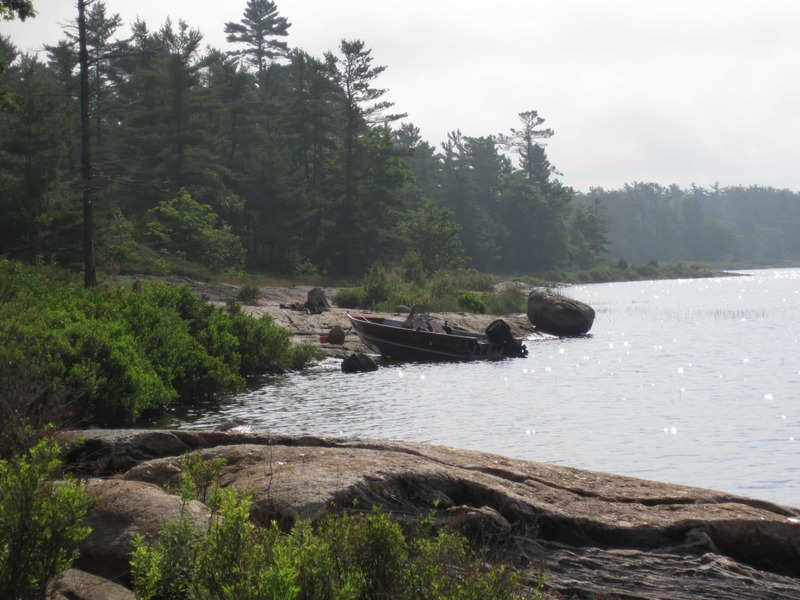 The Massasauga Provincial Park is a remote boat-access only park located two hours north of Toronto. Field work involves working outdoors regardless of weather, commuting to islands via motor boat, navigating off-trail, and collecting data in semi-rugged conditions. During the field component, there is the possibility of interaction with toxic plants or dangerous insects or animals. Common terrestrial hazards include off-trail obstacles (e.g. cliffs, dense vegetation) and flora and fauna (e.g. poison ivy, rattlesnakes, ticks, spiders). Water hazards are also possible. During the field portion of the project, students should be prepared for demanding, full days outdoors with evenings devoted to processing samples. Although sleeping accommodations will be in tents, we will have use of a cottage with electricity and running water for storing specimens and equipment, processing specimens, meal prep, etc. Field duties, facilities, and domestic responsibilities (e.g. meal prep) are shared. Students must be comfortable in the outdoors, be comfortable on boats, and be able to swim. Required gear includes a passport (or equivalent) to cross the US-Canada border, life jacket, day pack, sturdy hiking boots, appropriate clothes for field work, snake gaiters (recommended), sleeping bag and pad, memory stick or external hard drive. Gear to protect from rain, sun, and biting insects is recommended. The nearest town is 30 minutes away from basecamp; the closest medical facility is about an hour away. Cell phone reception is unreliable. Students should be prepared for demanding, full days in the laboratory and shop (e.g. sanding tree cores). Students should be well-organized and detail-oriented. Students will be housed in Wesleyan University dormitory-style housing. Kitchen facilities are available and a food stipend is provided. Recommended Courses/Prerequisites: Introductory geology (or physical geography) and GIS courses are required. For the soil assessment project, coursework in soils is required. Students with additional coursework in climate and statistics are preferred. Interests in interdisciplinary sciences (e.g. environmental science, geography, ecology) are advantageous. Cordiner, G.S. 1977. A Reconnaissance Earth Science Inventory of Blackstone Harbour Provincial Park Reserve. Algonquin Region: Division of Parks, Ontario Ministry of Natural Resources. Hirvonen, R. & R.A. Woods. 1978. Georgian Bay Islands National Park Integrated Resource Survey. Forest Management Institute, Ottawa. Larson, G. & R. Schaetzl. 2001. Origin and evolution of the Great Lakes. Journal of Great Lakes Research 27:518-546. Sly, P.G. & M. Munawar. 1988. Great Lake Manitoulin: Georgian Bay and the North Channel. Hydrobiologia 163:1-19.
van Luit, H. 1987. Blackstone Harbour: Management Plan Background Information Document. Ontario Ministry of Natural Resources, Division of Parks, Parry Sound, Ontario. Vigmostad, K.E, editor. 1999. State of the Great Lakes Islands. Paper read at US-Canada Great Lakes Islands Workshop, 1996, at Roscommon, Michigan.